The PV-mTV-100 Machine TV Interface transforms a consumer TV into an industrial HMI display and brings HD 720p High Resolution ‘large screen’ process monitoring to the control room. Simply connect the PV-mTV-100 to the Ethernet Router of the PowerView network, the HDMI output to any TV or Monitor with HDMI Interface and the PV-mTV-100 will deliver networked HMI output to virtually any large, wide screen TV. The relatively low cost of HD TV units and the PV-mTV-100 makes wall mounted, 1280 x 720p resolution graphic display a cost effective reality. As the PV-mTV-100 supports the full functionality of a PowerVision HMI the unit can perform the supervisory role while running its own application connected to a local PLC. 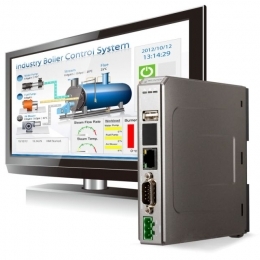 A standard Mouse pointing device connected to the unit gives Control Room Operators monitoring and supervisory access to a plant-wide network of PowerVision HMI units. The PV-mTV-100 makes changes to process parameters, alarm & recipe management, monitoring of real-time & historical trends and plant access & security all effective from a central location. The PV-mTV-100 is equipped with 256MB of both Flash Storage and System RAM, SD/SDHC support and a comprehensive array of Ethernet, USB and Serial Communication Ports.